Concordia junior Annie Weier is studying in Washington, D.C. this semester. Photo courtesy of Natalie Siede. rdia junior Shelby Reidle, with the National Cemetery Association (NCA). Though my internship is unpaid, my supervisors were not able to work, so I was also not able to go in. As a result, I’ve had a lot of time to explore D.C. and get ahead on classwork, and see the effects of the shutdown firsthand in empty Metro stations in the middle of the week, a very quiet National Mall and 19 temporarily shuttered Smithsonian museums, plus the National Zoo. At NMAH, I am an intern in the Exhibit Services department, where I will be helping clean, paint, and light different exhibits, as well as planning projects and collaborating with other museum departments and staff. As a heritage and museum studies major, this is the perfect place to build connections with professionals in my field. Reidle, a double-major in History and Heritage and Museum Studies and a minor in German, is completing an internship with the NCA. It is an online internship, so she is able to work from Moorhead, though the headquarters are in D.C. She is researching German prisoners of war (POWs) buried in national cemeteries, and building a digital compilation of her findings. “My internship is unique because I am able to meet a research need of the NCA. My German language skills have enabled me to translate headstones and newspaper articles about German POWs. The work is meaningful to me, and I am able to compile multiple perspectives (such as) local, federal, American and German to better understand the unique situation of these POWs,” she said. 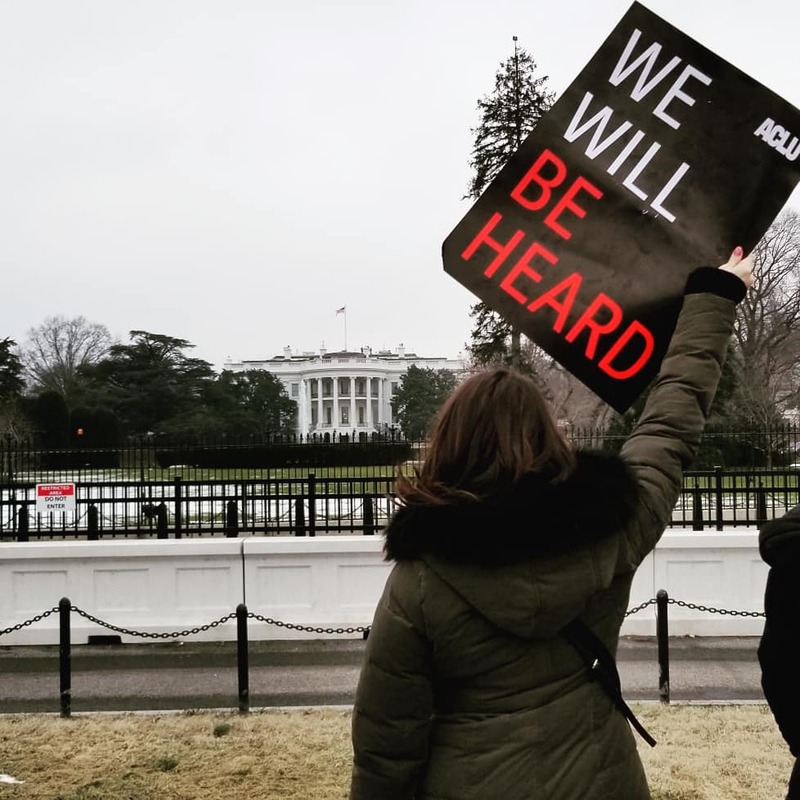 2019 Women’s March in D.C. Photo courtesy of Annie Weier. As of last Friday, Jan. 25, the government shutdown has been lifted (at least for the next three weeks). This means that federal employees are able to resume their work and we interns can continue (or start) our experiences at federal organizations. For me, I can meet my supervisors and start my assigned projects, and do as much as I can for the next three weeks, when the government may or may not shut down again. For Reidle, it is much the same. She wants to accomplish as much research as possible without being an added stressor to newly returning employees. While things are still settling into place, the next few weeks will call for patience and flexibility, as well as learning on the fly and communication between interns and their employers. Stay tuned for more updates from the nation’s capital! Annie is a sophomore double-majoring in Environmental Studies and Heritage and Museum Studies, as well as minoring in German. She loves adventures, coffee, and dogs. This is her first year writing for the Concordian. Tags: government shutdown, student intern, Washington D.C.